Linear A is, chronologically, the second of three scripts discovered by archaeologist Sir Arthur Evans while excavating the palace he named Knossos in Crete. Linear A, so named because it is the first of two linear scripts discovered, was used by the Minoan civilization, and dates to 1850-1700 B.C.E. Linear A may have evolved from earlier Cretan hieroglyphs, also discovered at Knossos, although some scholars view the two as coexisting simultaneously. Linear A may have evolved into Linear B, a written language that replaced Linear A around 1450. While Linear B script was deciphered in 1952, efforts to decipher Linear A have met with less success. Although decipherment is incomplete, Linear A inscriptions serve to shed light on Minoan administration, society, commerce, and religion, and a people and time that is long past but which is not forgotten. Linear A. Ink-witten inscriptions round the inner surface of cup, Sir Arthur Evans, 1909. British archaeologist Arthur Evans, inspired by ancient Greek mythology and the work of Heinrich Schliemann whose advocacy of the historical reality of places mentioned in the works of Homerled him to discovery of the Mycenaean sites of Troy, Mycenae, and Tiryns, purchased a large piece of land on the island of Crete. He was searching for remains of a civilization ruled by the legendary King Minos. Upon discovering the ruins of a palace, he labeled the civilization that inhabited the area "Minoan." While excavating the Knossos site in 1900, Evans discovered a number of clay tablets and seals with three distinct forms of writing on them. One form of writing was Cretan Hieroglyphs, a pictographic script that was imprinted predominantly on clay seals. The other two forms, which Evans dubbed "Linear A" and "Linear B," looked to be simplified, linear versions of the hieroglyphic script. Evans uncovered about 3000 writing tablets containing Linear A and B scripts from the excavations at Knossos. Linear B was deciphered in 1952 by Michael Ventris, proving to be an early form of ancient Greek. Linear A represents the language of the Minoan people before the Mycenaean occupation of the site, a language known as Eteocretan ("True Cretan") that has remained undeciphered. The Palace at Knossos, reconstructed by Arthur Evans. Linear A texts have been found in numerous locations containing remains of the Minoan civilization, from the palace at Knossos in Crete to the Akrotiri site on the island of Thera. The majority of Linear A documents appear to have been used for administrative purposes: Labels and clay tablets that record inventory or census information are common. The text on these documents is written in horizontal lines, often using marked registers. Tablet of Linear A (Ph-1). Few of these items were discovered in their original locations—fires and earthquakes caused most Linear A artifacts to fall into lower levels. The largest deposits of Linear A artifacts were found at Agia Triadha, where two buildings contained about 150 tablets and 861 nodules. Excavations at Knossos unearthed 150 Linear A seal impressions and three disks and excavations at Khania yielded 97 clay tablet fragments with lists and censuses, as well as 122 roundels and 28 nodules. Other notable sites include Phaistos, where four flat-based nodules, four roundels, and one sealing on a chest were discovered, as well as the Phaistos disc. Items containing Linear A text have been discovered at the sites of Archanes, Gournia, Malia, Palaikastro, Petras, and Zakros on Crete, as well as Minoan sites on other islands such as Keos, Milos, and Thera. Detail of the Phaistos Disc. One of the most famous Minoan artifacts is the Phaistos Disc, a round clay disk imprinted with symbols that was found in the ancient palace site of Phaistos, near Hagia Triada, on the south coast of Crete. It was found in the main cell of an underground "temple depository." In the northern part of the main cell, a few inches south-east of the disc, Tablet PH-1 inscribed in Linear A had been found. This naturally led to an expectation that the symbols on the disc might also be Linear A. The disc, which contains a number of pictographic signs arranged in a circular pattern, is thought to date around 1700 B.C.E., making it contemporary with Linear A. While some scholars believe that certain symbols on the disk are similar enough to Linear A or Linear B signs to suggest similar phonetic values, others point out that human figures on the disk are clearly non-Minoan in origin, and that the disk was probably imported. The meaning and purpose of the disc has long been a topic of debate. Some have viewed the disc as technically meeting all definitional criteria to represent an early, if not the earliest incidence of movable type printing. Other possibilities have included a poem, a calendar, a sacred text, magical inscription, or a board game; or simply a forgery. It has been suggested the the disk is a fake, planted by Arthur Evans' rival Luigi Pernier, an Italian archaeologist. According to this theory, Pernier wanted to attract the same attention to the palace at Phaistos that Evans was generating at Knossos, and created an "ancient relic" with untranslatable text to draw interest to his own work. Linear A incised on a vase found in Akrotiri. One of the largest obstacles in the decipherment of Linear A texts is that the ancient Minoan language that it represents is unknown, and may not even belong to a known language family. Linear A may be similar to other Indo-European languages (such as Luwian), Indo-Iranian, or Semitic languages, although many of these comparisons are speculatory at best. A number of signs are similar to those found in Linear B, but this does not mean that they are similar in either phonetic value or in meaning. Additionally, the majority of Linear A signs have no link whatsoever with any Linear B sign. A popular theory from the 1960s, based on Linear B phonetic values, is that Linear A could be the written form of an Anatolian language, close to Luwian. The Luwian origin of Linear A theory, however, lost many supporters over the second half of the twentieth century with the growth of archaeological and linguistic data about Anatolian languages and peoples. In 2001, Jan Best published an article claiming to demonstrate how and why Linear A notates an archaic form of Phoenician. This was a continuation of attempts by Cyrus Gordon in finding connections between Minoan and West Semitic languages. His methodology drew widespread criticism. While one or two terms appear to be possibly of Semitic origin, there is not enough evidence to secure a connection between the language of Linear A and Semitic idioms. Contrary to most other scripts used for Semitic languages, Linear A includes many written vowels. French scholar Hubert La Marle has suggested that Linear A may belong to the Indo-Iranian family of languages. His theory is based on the frequencies of each sign in certain positions, as well as comparisons of Linear A to other ancient scripts from around the eastern Mediterranean. La Marle suggested that using these two methods provides conclusions about the phonetic nature of the syllabic signs for a good majority of signs, and that aspects of Linear A closely resemble ancient Indo-Iranian. In 1997, Gareth Alun Owens published a collection of essays entitled Kritika Daidalika, in which he suggested that the Minoan language represents a pre-Greek Indo-European language. Owens based this assertion on the perceived Indo-European but non-Greek roots of a small number of words he was able to read by using the known Linear B sound values of certain Linear A signs. A glottochronological study by linguists on the Indo-European language family has placed the break up of Proto-Indo-European into separate languages at least as far back as the seventh millennium B.C.E. With this timeframe, and based on his further study of Linear A and Cretan hieroglyphs, Owens concluded that Minoan is a "Cretan cousin" of the Greek and Armenian languages, branching off from Proto-Indo-European after the Hittite branch, but before Armenian, Greek, and Indo-Iranian. Scholars continue to work on the decipherment of Linear A texts, and future discoveries may help to clarify the meaning of the language. Regardless of the origin of the Phaistos disc, deciphering Linear A depends not just on a single artifact but on the inscriptions on many items, and probably requires more than have been uncovered to date in order to complete its translation. It can be concluded, however, that Linear A is distinctly different from the archaic form of Greek of which Linear B is the graphically related script. It is also possible that the language of Linear A, the Minoan language, is a relative of Indo-European or Indo-Iranian languages and hence of languages still in existence. However, it is also possible that it separated from the main stream far back in time, and thus the similarities are too distant to make a complete decipherment possible. At least the finding of additional texts appears necessary. 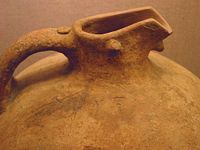 Nevertheless, much has been learned about the Minoan civilization through study of the artifacts inscribed in Linear A. For scholars such as Owens, the Minoans belong to history not pre-history, and the Linear A "Minoan inscriptions and Minoan language are there to be understood." Such study reveals not just linguistic information about the language represented by Linear A, but, perhaps more significantly, about the Minoan civilization itself—their religious beliefs and practices, their administration, agriculture, commerce, and even professions such as medicine as practiced in those times long past. ↑ "Sir Arthur Evans and the Excavation of the Palace at Knossos," Athena Review 3(3) (2003). Retrieved February 23, 2009. ↑ Athenapub.com, “Bronze Age Writing on Crete: Hieroglyphs, Linear A, and Linear B”, Athena Review 3(3) (2003): 21. Retrieved February 23, 2009. ↑ C. Michael Hogan, "Phaistos fieldnotes," The Modern Antiquarian, 2007. Retrieved February 23, 2009. ↑ Herbert E. Brekle, "Das typographische Prinzip," Gutenberg-Jahrbuch 72 (1997): 58–63. ↑ Brian Haughton, Hidden History: Lost Civilizations, Secret Knowledge, and Ancient Mysteries (Franklin Lakes, NJ: Career Press, 2007, ISBN 1564148971). ↑ Dalya Alberge, "Phaistos Disc Declared as Fake by Scholar," The Times Online, July 12, 2008. Retrieved February 23, 2009. 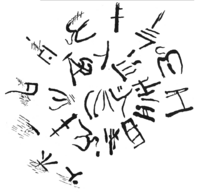 ↑ John Younger, “Linear A Text in Phonetic Transcription” (December 2008). Retrieved February 23, 2009. ↑ Jan Best, "The First Inscription in Punic—Vowel Differences in Linear A and B," Ugarit-Forschungen, Band 32, Internationales Jahrbuch fur die Altertumskunde Syrien-Palastinas: In memoriam Cyrus H. Gordon, Oswald Loretz (ed.) (Ugarit-Verlag, 2001, ISBN 3934628001). ↑ Hubert La Marle, "In Search of the Linear A People" (November 1997). Retrieved February 23, 2009. ↑ Gareth Owens, "The Structure of the Minoan Language," Kritika Daidalika, 1997. Retrieved February 23, 2009. ↑ Russell D. Gray and Quentin D. Atkinson, "Language-tree divergence times support the Anatolian theory of Indo-European origin," Nature 426 (November 27, 2003): 435-439. Retrieved February 23, 2009. ↑ 12.0 12.1 Gareth Owens, Labyrinthos: graphes kai glōsses tēs Minō·ikēs kai Mykēna·ikēs Krētēs (Labyrinth: scripts and languages of Minoan and Mycenaean Crete) (Ērakleion, Greece: Kentro Krētikēs Logotechnias, 2007). Retrieved February 23, 2009. Best, Jan G. P. Some Preliminary Remarks on the Decipherment of Linear A. Las Palmas, Spain: Hakkert, 1972. ISBN 9025606253. Best, Jan G. P. Oswald Loretz (ed.) "The First Inscription in Punic—Vowel Differences in Linear A and B." In Ugarit-Forschungen, Band 32, Internationales Jahrbuch fur die Altertumskunde Syrien-Palastinas: In memoriam Cyrus H. Gordon. Ugarit-Verlag, 2001. ISBN 3934628001. Campbell-Dunn, Graham. Who were the Minoans? An African Answer. Bloomington, IN: Authorhouse Press, 2006. ISBN 1425920071. Evans, Arthur. Scripta Minoa: The Written Documents of Minoan Crete, with Special Reference to the Archives of Knossos. Clarendon Press, 1909. Haughton, Brian. Hidden History: Lost Civilizations, Secret Knowledge, and Ancient Mysteries. Franklin Lakes, NJ: Career Press, 2007. ISBN 1564148971. Owens, Gareth. Labyrinthos: graphes kai glōsses tēs Minō·ikēs kai Mykēna·ikēs Krētēs. (Labyrinth: scripts and languages of Minoan and Mycenaean Crete). Ērakleion, Greece: Kentro Krētikēs Logotechnias, 2007. Retrieved February 23, 2009. ISBN 9608684757. Woodard, Roger D. Greek Writing from Knossos to Homer. New York, NY: Oxford University Press, 1997. ISBN 0195105206. This page was last modified on 23 July 2018, at 15:31.